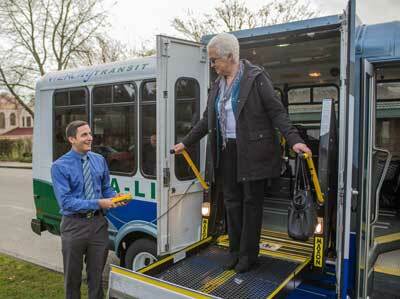 Dial-A-Lift is a door-to-door, shared ride public transportation service for people with disabilities that prevent them from using our fixed route bus service. We offer Dial-A-Lift service where and when fixed route buses operate. You must complete an application, be eligible and certified to ride Dial-A-Lift. You must be eligible and certified to ride Dial-A-Lift. When riders do not cancel at least two hours in advance or are not available to board within five minutes, you will be considered a no-show. You can begin requesting trips as soon as we notify you of your eligibility. Fare costs for riding the bus and Dial-A-Lift services. Major transfer points that serve several routes.